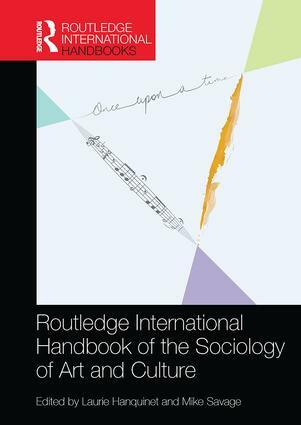 The Routledge Handbook of the Sociology of Arts and Culture offers a comprehensive overview of sociology of art and culture, focusing especially – though not exclusively – on the visual arts, literature, music, and digital culture. Extending, and critiquing, Bourdieu’s influential analysis of cultural capital, the distinguished international contributors explore the extent to which cultural omnivorousness has eclipsed highbrow culture, the role of age, gender and class on cultural practices, the character of aesthetic preferences, the contemporary significance of screen culture, and the restructuring of popular culture. The Handbook critiques modes of sociological determinism in which cultural engagement is seen as the simple product of the educated middle classes. The contributions explore the critique of Eurocentrism and the global and cosmopolitan dimensions of cultural life. The book focuses particularly on bringing cutting edge ‘relational’ research methodologies, both qualitative and quantitative, to bear on these debates. This handbook not only describes the field, but also proposes an agenda for its development which will command major international interest. A social aesthetics as a general cultural sociology?